A long time ago (well, eight years) I put together a book to help prepare young people for believer’s baptism. It was called ‘Making a Splash’ and was published by the Baptist Union of Great Britain. It was written in collaboration with for youth workers (who wrote some of the sections) and proved to be rather popular. In fact we found that churches were using it to prepare people of all ages for believer’s baptism, not just young people. …grateful, chuffed, proud, and excited. I’m grateful for the hard work by the designer (David Elcock), the team at Baptist house and those who contributed to the original version. I’m chuffed because it looks so good and while it has remained true to the original concept now looks even better. I’m proud because for the first time it has my name on the front cover. Previously, when I imagined/wrote/edited the initial book, I was working for BUGB and it was the practice that employees did not get a named credit on any publications (they didn’t want us to get big headed I guess). I was really pleased that the 4 youth workers (Helen Bellamy, Claire Earl, Gary Bott and Andy Levett) were credited inside and am equally pleased that they have retained that credit in the updated version (thanks again guys!). But, if I’m honest, I was a little bit miffed at the time that my name was not credited or associated with the book. When I was asked to rewrite it I did ask (lacking humility) if it might be possible to have a named credit and there it is: my name is on the front cover! But mostly I’m excited because this book will be used to help people prepare for one of the most significant, special, profound and memorable days of their life – the day of their baptism. On that occasion they will not only declare their faith publicly and get very wet into the bargain but they will also experience God’s, “Well done!” To have contributed to that in a little way is awesome. No autographed copies will be made available (I don’t want to devalue the book) but you can buy your copies from the Baptist Union website. And if reading it helps you as you prepare to be baptised, then WOOOOOHOOOO! 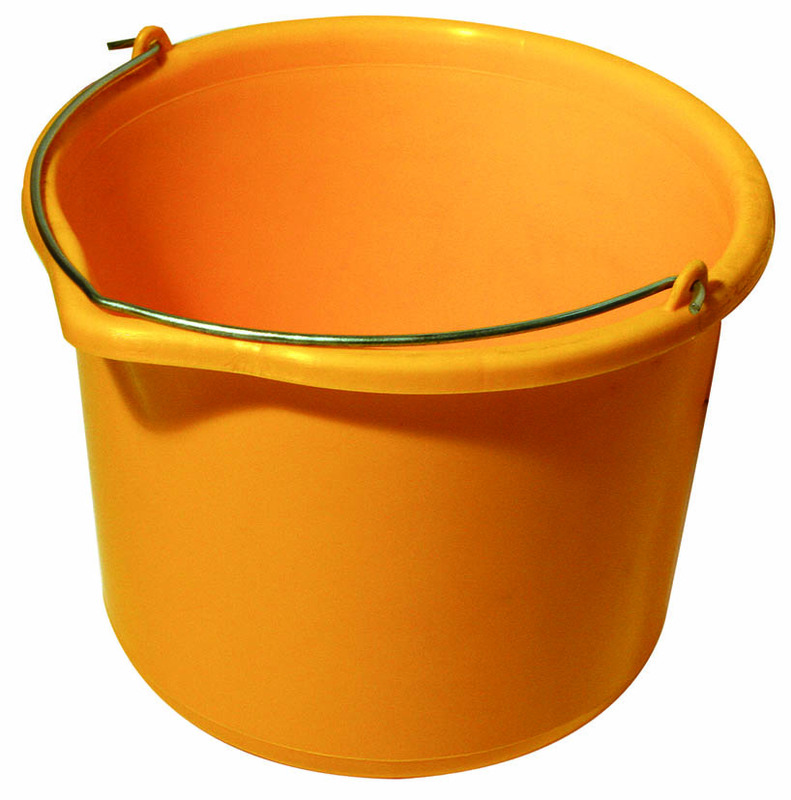 Don’t leave what God wants you to do on your ‘to do list’… it may end up on your bucket list! It was a momentous day. I was not aware of just how momentous it was. Indeed I am still growing in my appreciation of that. 25th May 1980. Torquay. It was a Sunday morning and I was about to get wet. Very wet. 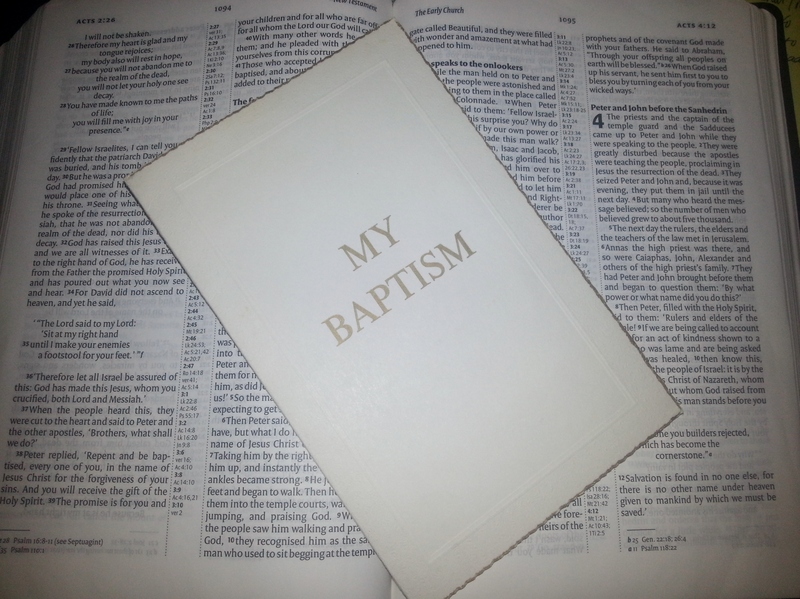 I was baptised by immersion as a follower of Jesus on that day. I had known him as my friend since the age of six, but my awareness of him had grown and the sense that I needed to be baptised grew irresistible. I found Baptismal services very moving. A number of times before then at the end of a Baptismal service I had wanted to respond to the Minister’s invitation for anyone who wanted to be baptised themselves but had been kept back. But at the Baptismal service before this one I knew I had to respond and I made the very long journey from the balcony in our church down to the front. You can’t see the difference can you? Well the second one has three ‘i’s and we joked that I should read “eye eye eye follow him through baptism”. I can’t remember too much about the baptism itself, it happened rather quickly. Our two Ministers, Peter and Nick plunged me under the water and back up again “on my profession of faith in Jesus.” Then they read out a Bible verse that they had chosen for me which they felt was appropriate. Why all the reminiscing? Well 25th May 1980 was Pentecost Sunday that year (it’s a moveable feast dependent on the date of Easter). This coming Sunday is Pentecost this year. It will be the 34th anniversary of my Baptism. And even though I have not always followed Jesus as closely as he (or I) would like, he has always been there for me. He has never let me down. It has not always been easy. In fact sometimes it has been [insert extreme adjective here] hard. But I have always known that Jesus has been with me by his Spirit. This Sunday morning we are baptising someone who has only been a follower of Jesus for a couple of months – it is so exciting. We will also have a couple of people renew the promises they made when they were baptised a number of years ago – that is so exciting. And we will have one lady who wants to share her testimony decades after she was baptised because she didn’t have an opportunity to do it then – that is so exciting. If you can possibly be there, do come. Come to support those who are sharing. Come to celebrate with us. And come to meet with Jesus by his Spirit. (You have to recognise that the fish is swimming downwards). Oh yes. A cross, water and a fish (plus a ‘b’ for ‘baptists’). In some ways nothing has changed, but in others plenty has changed. On Sunday evening I am preaching on Acts 15, where the early Christians had to work out what was unchangeable about being a Christian, and what God wanted them to hold lightly and be ready to change. Questions were raised about whether being circumcised was essential for being a Christian – thankfully they discerned that this was not essential. They discussed what sort of food could be eaten (including that which had been sacrificed to idols and was now being re-sold (probably discounted) – they felt that it was best that they avoided that (along with a few other items of food and sexual immorality – interesting how it is last in the list!). In essence I think the advice was for them not to get mixed up in the cult worship of the surrounding culture: if it was about worship they should focus only on worshipping God as revealed in Jesus and not be distracted. Is it essential to accept that Jesus, God incarnate, died on the cross for you and receive the forgiveness God offers us, following him for the rest of our life? [cue sounds of rocks being gathered and ecclesiastical gavels being banged]. The cross is essential and was probably the earliest Christian symbol. The fish was an early Christian symbol too. In Greek the word for fish is ‘ichthus’ and in Greek this is also an acronym that means ‘Jesus Christ, God’s Son, Saviour’. That is pretty essential. The water represents believer’s baptism, one of the things that made our foreparents (forefathers and foremothers) distinctive when they started forming Baptist churches just over 400 years ago. Believer’s baptism is an early Christian event too (Jesus told us to get wet) that expresses faith in Jesus and affirms our commitment to him as his followers. (Yes there’s a lot more here, but I will save that for another day). Did the early Christians get thrown to the lions for believing more than that? Would you be willing to die for anything more than that? Is anything else essential? Answers on a postcard (preferably not wrapped around a brick) – or you can give some feedback on the blog page by clicking the link at the top of this bloggage. On Saturday I attended the reopening of our local Salvation Army premises following a significant refit. It is very impressive and a great improvement on what they had. I particularly liked the prayer that asked that the walls would soon be scuffed and that there would be marks appearing because the premises are being used so well for sharing the good news of Jesus in word and deed. 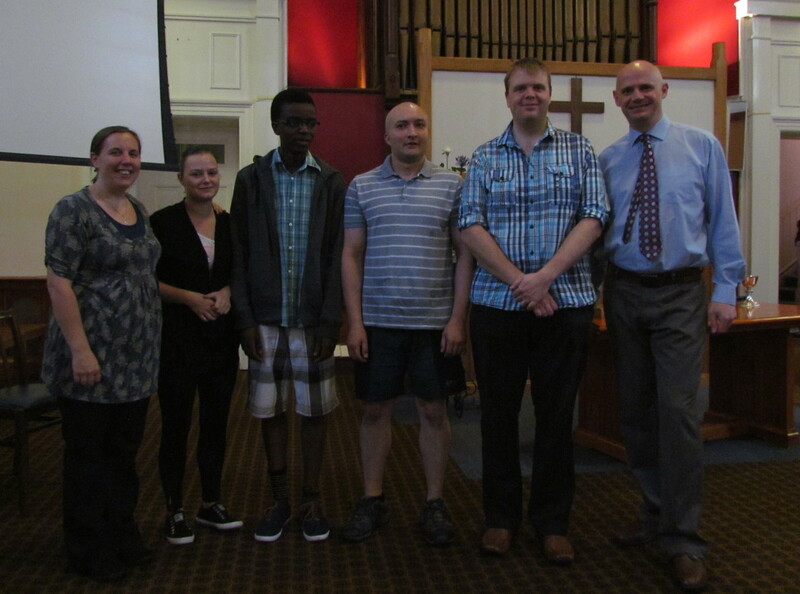 On Sunday morning we had a service of Believer’s Baptism, where 4 people were baptised. They shared four very different life stories and were inspirational, encouraging and wonderful in what they shared. 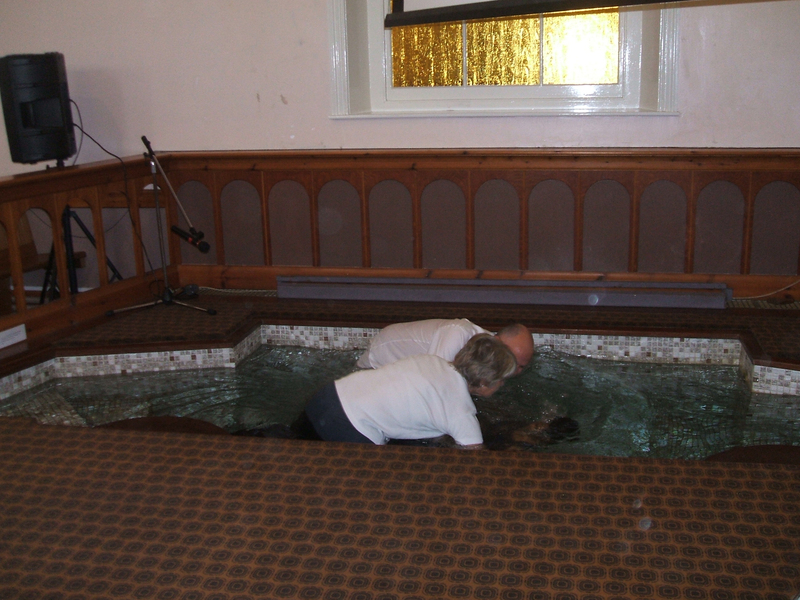 Baptising them was wonderful – one of the highlights of being a Baptist Minister. Grace abounded! Four brave and slightly soggy people after their baptisms – and two grinning ministers! And, on a completely different tack (pun intended) there was incredible sportsmanship shown on the Tour de France. I think there is growing excitement and interest in this bike race as there are two British riders leading the event. Yesterday on one of the climbs someone threw some tacks / nails onto the road as the cyclists were approaching and 30 riders suffered punctures. The Tour leader, Bradley Wiggins, was unaffected but when he realised what had happened he slowed up the whole race and waited for those who had been affected to catch up again when they had been given new bikes / wheels. One of the people affected was the rider in third place. What incredible sporting behaviour – to refuse to take advantage of someone else’s misfortune! To me that makes Bradley Wiggins a prime candidate for Sports Personality of the Year regardless of whether he wins the Tour de France. That God’s grace knows no limits, especially those I may put on it by the limits of my imagination or expectations. That the only person whose misfortune I should take advantage of is Jesus on the cross. A man was hurtling along the road, in excess of the speed limit when he was pulled over by a traffic cop. The officer wrote out a ticket and handed it to him. “What am I supposed to do with this?” grumbled the man as the policeman handed him a speeding ticket. Sunday morning promises to be amazing. Five people will be witnessing to their faith in Jesus Christ in Believer’s Baptism. I LOVE baptising people: it is one of the privileges and highlights of being a Minister (there are a lot!). It’s not so much the physical act of baptising someone, although the child in me likes the idea of dunking someone, but what it represents. Believer’s Baptism is a public statement of what we believe: you can’t really do it in private. It is an affirmation of faith in Jesus who died, was buried and rose again, enacted with water. It is an act of obedience – Jesus told us to baptise those who have become disciples of his. It is a spiritual landmark that we can look back on and remember with joy. On Sunday two of the candidates have asked if we can sing ‘Amazing Grace’. Abso-woohoo-luteley! John Newton, who wrote the hymn, had been involved in the Trans-Atlantic Slave Trade when he had a powerful experience of God. He became aware of his own guilt, sin and shame, and yet God’s amazing grace broke through that to transform him, to give him a hope and a future. I am acutely aware of my own regular need of God’s amazing grace and know that what our five friends will share on Sunday will demonstrate how they have received and experienced it too. It’s free, it’s freely available and it’s for you. And if you’re in Colchester on Sunday morning you’re welcome to join us at 1030 to see for yourself! Sucking lemons makes your face turn inside out. The fridge light does go out when the door’s closed. If a tree falls on you in the forest when there’s no-one else around, you will make a sound. Author nukelearfishing67Posted on Jul 11, 2012 Jul 11, 2012 Categories baptism, baptists, following Jesus, graceTags affirmation of faith, spiritualityLeave a comment on amaaaazing! There is a ‘new for old’ policy for golf equipment that is stolen, lost or damaged. It covers personal accidents (presumably from all the scratches I get rummaging around in the bushes looking for wayward balls that are not stopped by hitting people). There is cover for accidental damage to Third Party Property (presumably windows damaged by wayward shots that miss the people and the bushes). There is cover for dental treatment. Yes, you did read that right: dental treatment. I assume that’s for when you hit a wayward shot against a tree and it pings back and breaks your teeth, Tom and Jerry style. There is an amount to cover hiring golf equipment if you have suffered loss or theft. And there’s an amount to cover repaying some of your Club Subscription, presumably if you are recovering from the dental treatment mentioned above. There is one more aspect to the cover, which I love. 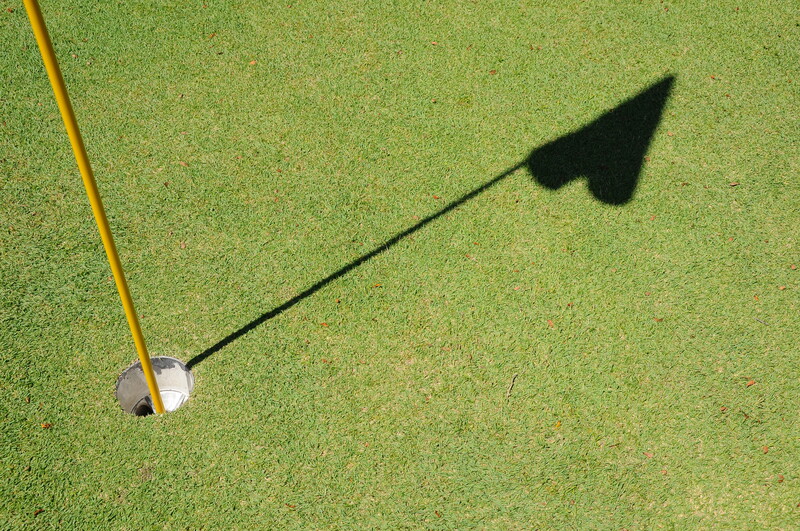 There is £150 available for if you score a hole in one, to cover the bar bill. (It is traditional to buy everyone a drink in the bar after you have scored a hole in one). I love the idea of insuring against such a brilliant thing happening. Personally I can’t imagine ever hitting a green in one, never mind getting the ball in the hole with just one shot, but it does happen and if you take out this insurance you will be protected from a hefty bar bill. I wonder if the Baptist Insurance Company should offer the following extras on their policies for churches. Insuring against someone coming to faith: provides a sum of money to have a party in the church when someone becomes a Christian. Insuring against baptisms: provides money for towels, increased water useage and mopping up afterwards. Insuring against new members: buys membership cards, additional printing of minutes and agendas for meetings and any additional printing, pays for an extra cushion for the hard pews. Insuring against God moving in the church: pays for tissues (tears of joy or sadness), sedation for Ministers (when someone says that the sermon spoke to them), replacing burnt dinners because the service went on longer, therapy for children’s group leaders who have longer with the little darlings than expected. I hope you realise my tongue is firmly in my cheek as I wrote the above, but the idea of insuring against good news got me thinking silly thoughts. How about we think of all the good things that God is doing at the moment and instead of insuring against them we thank God for them, encourage one another with them and tell people beyond the church about them?